At Accordant Company, we get a lot of questions about the differences between Sage 100 Contractor versus Sage 300 Construction and Real Estate (CRE). While both software packages are designed specifically for the construction industry, each offers a unique variety of features, options, and technology that address different needs in different ways. So we decided to put this guide together to help you compare products. Since both Sage 100 Contractor and Sage 300 CRE offer a huge range of construction-related functionality, this is not a detailed feature-by-feature breakdown. Instead, we focus on the most important “difference makers” that help our clients decide which software product is a better fit for their unique need, industry, and company. Sage 100 Contractor delivers integrated estimating, production, accounting, and reporting that you just don’t get with basic off-the-shelf accounting software like QuickBooks. It provides construction-specific features that help you streamline workflow and improve efficiency. At the same time, Sage 100 is designed for simplicity so it doesn’t overwhelm your accounting personnel with too many options, fields, and functions that can be confusing and unnecessary to smaller contractors and construction companies. Sage 300 Construction, on the other hand, is well-suited for larger construction firms that want to fine-tune the software around their unique workflow processes. With a wider range of features and configuration options, you can personalize the function and behavior of individual screens, fields, transactions, and tasks throughout Sage 300 CRE. In short, a larger range of options and added level of control allows you to create customized workflow that is tailored to your company’s exact needs. With more projects, more complexity, and more people working in the system, larger companies tend to need the added control, automation, and personalized configuration options in Sage 300 CRE. For smaller firms and contractors, these options might be overkill and add unnecessary complexity to functions that Sage 100 Contractor handles in a more standardized, but simpler way. Plenty of accounting packages offer features for managing multiple companies and Sage 100 Contractor is no exception. It provides a wide range of advanced multi-company management and reporting options typically seen in larger software packages while remaining simple enough for a one-bookkeeper office. But when it comes to managing and processing inter-company transactions and consolidated reporting, Sage 300 Construction and Real Estate really stands out. When you manage multiple business entities in Sage 300, all of the appropriate due-to, due-from, and inter-company journal entries are automatically created. There’s no need to open multiple company folders, multiple screens, or balance inter-company transactions outside the system. Because all entities are managed in the same Sage 300 database, a change to a master vendor file, for example, updates that same vendor across all companies. Similarly, it’s easy to run consolidated reports and account balances (i.e. cash on hand) across all entities. If you’re a real estate development company or property management firm, it’s not uncommon to manage multiple projects (i.e. store, commercial building, apartment complex) as separate legal entities. In that case, Sage 300 Construction and Real Estate is almost always a better fit than Sage 100 Contractor. Both software applications do a great job of managing the finances of a construction company including general ledger, accounts payable, accounts receivable, job cost, payroll, and other core accounting functions. However, Sage 300 begins to distinguish itself for larger construction companies that need more functionality and automation that extend beyond the back office. On the operations side, it offers deeper and broader features for project management, service management, and equipment management. A specific example relates to property management companies that would need Sage 300 CRE for the dedicated property management module – functionality that’s not available in Sage 100 Contractor. Another good example is the change management functionality. Indeed, Sage 100 Contractor provides powerful functionality for creating and managing change orders in the system and updating their status with settings like pending, approved, denied, and not issued. In Sage 300 CRE, you can take it a step further and develop change proposals based on your communications with the client that can later be converted into change orders. Once the changes are accepted by the client, the change order can automatically update in AIA. In fact, the whole process can start with an RFI, thus automating much more of the process. Both software applications handle change orders fantastically well, but in different ways. For smaller companies, just having change order functionality built into your accounting system and workflows is a HUGE step up from what you’re doing today. While larger companies may already be using change order functionality, but want to automate MORE of the process than they are currently. If you need an easy-to-use solution for estimating, scheduling, project management, and accounting that goes above and beyond QuickBooks while offering construction-specific functionality, Sage 100 Contractor is a fantastic choice. Sophisticated yet simple, it’s designed to get you up and running quickly without a great deal of setup and training. Indeed Sage 300 CRE delivers an unmatched level of configuration options and workflow automation. But more features and options require more configuration, setup, and training. 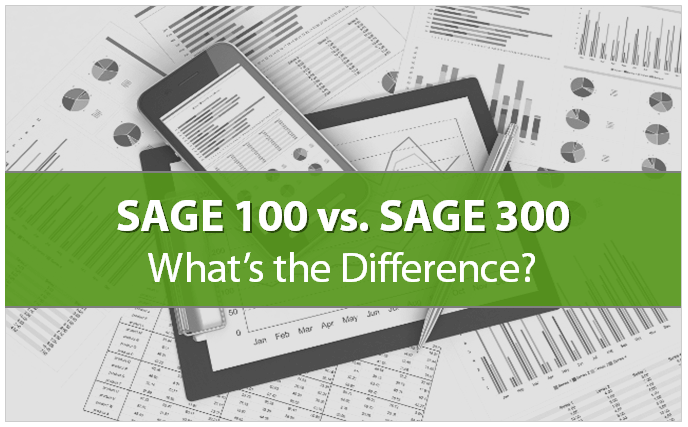 So when it comes to cost, not only is the Sage 100 Contractor software more affordable, the implementation time is about half that of the typical Sage 300 CRE project. Whether you’re buying a new car, computer, or software application, it usually comes down matching your unique needs with the right combination of features and budget. Sage 100 Contractor is a great fit for smaller companies that have outgrown their basic accounting software and are ready to leverage technology that’s built for the construction industry. At the same time, they want to be up and running quickly and avoid overwhelming the accounting staff or overpaying for features they may not need or use. With more projects, more complexity, and more people working in the system, larger companies tend to need the added control, automation, and personalized configuration options in Sage 300 Construction and Real Estate. At Accordant Company, we know software, we know construction, and we know how to keep your business ahead of the curve. Feel free to get in touch if you still have questions or would like to see a personalized product demo of Sage 100 Contractor or Sage 300 Construction and Real Estate.